Users can easily print photos from their homes with the HP Photosmart D5155 photo printer. This compact unit can print on a wide range of media, including CDs and DVDs. This model offers high printing resolution at decent speeds. It has a monthly duty cycle of 3,000 pages. The HP Photosmart D5155 colour photo printer doesn’t offer Wi-Fi connectivity. The Photosmart D5155 photo inkjet printer has a paper tray that can handle 125 plain sheets at a time. It also has a dedicated tray for photo paper and can carry up to 25 sheets. 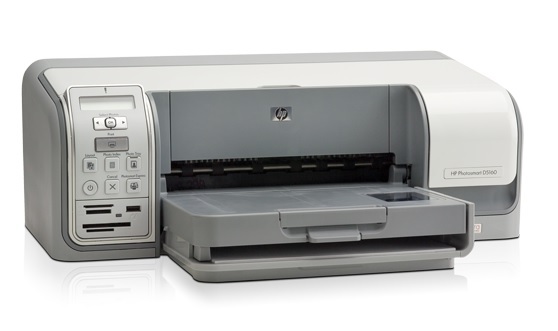 For connectivity, the HP D5155 photo printer has memory card readers as well as a front USB port for PictBridge and Bluetooth to support direct printing from digital cameras and mobile devices. The rear USB port is for the computer. The Photosmart D-5155 inkjet printer measures 158 x 465 x 230mm and weighs 4.2kg. The HP Photosmart D-5155 has a print speed of 23ppm for black and 21ppm for colour. It can also deliver 10 x 15cm photos in as fast as 27 seconds. This model offers a maximum resolution of 1200 x 1200dpi. It’s very easy to use the Photosmart D5155 printer, thanks to its control panel with one-touch buttons and display. The HP Photosmart D5155 colour inkjet printer would be better if it offered Wi-Fi connectivity. This would allow for more mobile devices to be used for direct printing.